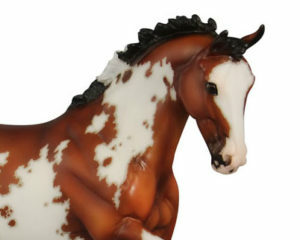 Breyer revealed the horse from their May 8th Sneak Peek. 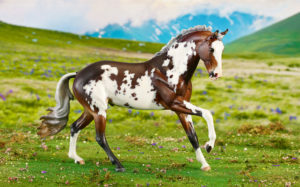 Meet the Breyer Masala! She (he?) is the brand new Premier Club True North mold in an absolutely stunning bay pinto. Breyer refers to the mold as the Cantering Warmblood which was sculpted by the talented Morgen Kilbourn. The actual Premier Club True North is due out this month so his release is imminent. 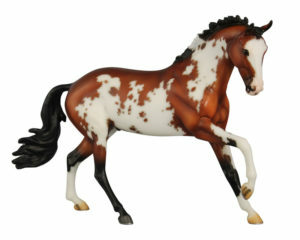 Come on Breyer, I’m ready to throw my money at you for True North, LOL! Masala is the Best Customs Contest Grand Prize awarded to the winners of each division. There are a total of five models – four for the Best Customs prizes and one for the Live Auction. Masala is a bright bay pinto on Morgen Kilbourn’s new Cantering Warmblood model (mold 739). The Cantering Warmblood was the first Premier model of 2017. Best of luck to all of our competitors! We hope Masala inspires all of your Best Customs work!